In 1948, J. Edwin Lewis established QuinCraft Products, an aluminum spin forming business in Quincy, Kansas. The factory was equipped with surplus spin forming lathes from the post war aircraft industry. QuinCraft Products originally did subcontract work for VitaCraft, an aluminum cooking utensil company in Kansas City. However, Mr. Lewis knew his company needed to have a product line of his own for the long term stability of his company. In 1952, Mr. Lewis realized his dream when he went to Raven, Missouri and met with C.B. Curry, an electrical engineer who was looking for someone to produce a popcorn popper he had invented and named the "Mazy Pop". Edwin Lewis knew that this was an amazing product as soon as he saw it pop one batch of popcorn. (Rather than being a contractor to make the "Mazy Pop") Mr. Lewis immediately purchased all manufacturing and marketing rights to the "Mazy Pop". 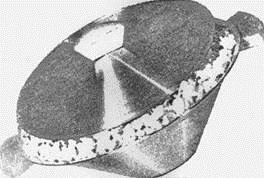 The popper's conical shape and basic design was not changed. However, he added attractive wooden handles and knob to the lid. In keeping with the time, he renamed the "Mazy Pop"to its current name "Atom Pop". 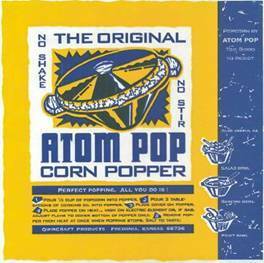 With this the "Atom Pop" a no shake - no stir popcorn popper was on the market. Edwin Lewis and his wife, Martha Lewis, grew their company to 17 employees including a rate of more than 20,000 "Atom Pop" corn poppers a year. With the untimely death of Edwin Lewis, Martha Lewis was left to run QuinCraft Products on her own. Having the "Atom Pop" kept the company strong even though aluminum kitchenware was fading and stainless steel and plastic kitchenware was coming into production. QuinCraft stayed with its roots as an aluminum spin forming business. 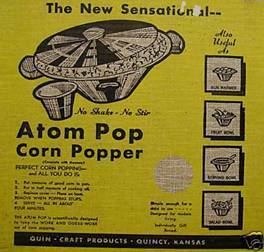 With the advent of corn popping appliances and then of the microwave popcorn diminished the demand for stove top popcorn poppers, and QuinCraft saw the "Atom Pop" sales decline. After the death of Martha Lewis, Jane Lewis Ferguson, a daughter of Edwin and Martha Lewis, along with her husband Gilbert Ferguson, obtained QuinCraft Products and the sole surviving product the "Atom Pop" popcorn popper and moved the business 31 miles to the southeast to Fredonia, Kansas in 1975. Even though they were employed full time, with the help of some part time help, they kept the production of the "Atom Pop" going only by its loyal customer following and their recommendations to new customers. In 2005, the Fergusons knew it was time to pass the "Atom Pop" on to someone who would keep it going for its loyal fans. 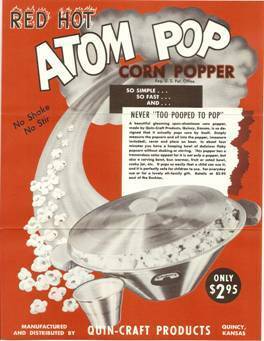 They wanted someone who would have the same attention to the quality and history of the product to make the "Atom Pop" corn popper. In keeping with its history, the Orth Brothers kept the name QuinCraft Products for their new company. With that, the "Atom Pop" corn popper moves into the 21st Century. the Fergusons and their spinner, Jerry Cole, instructed the Orth Brothers on the skills of hand spinning the "Atom Pop" corn popper. The orth Brothers appreciate the time and care the Fergusons and Jerry Cole spent on passing on their art skills. 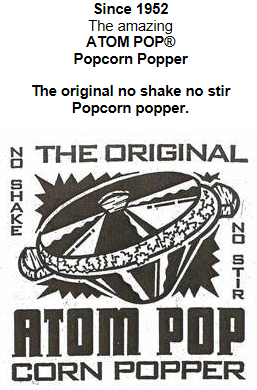 The "Atom Pop" corn popper is staying with its Kansas roots with the relocation by the Orth Brothers to Bushton, Kansas. Some of the equipment has been and continues to be in use by QuinCraft Products for more than 60 years. The Orth Brothers are upgrading and purchasing additional equipment to increase production. Sales have been steadily rising from the loyal customer following and a new generation of popcorn lovers as a healthy alternative to microwave popcorn.